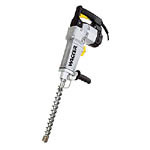 Wacker Neuson drills & breakers, drills, concrete breakers-Kelly Tractor Co.
Kelly Tractor Co. offers a wide selection of Wacker breakers and breaker-drills including pneumatic, electric, and gasoline powered units. 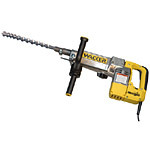 The innovative magic drilling and chiseling hammers save money because they lose no time due to maintenance and failures: The three-phase AC motor means that there is no changing of worn-out carbon brushes. Failures due to burnt-out windings in the rotor of the motor are likewise a thing of the past. On the other hand, the built-in frequency inverter is a very useful feature, since it means that magic electric hammers can be plugged in to a standard 230 V mains socket. 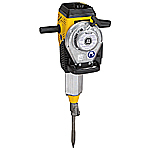 These electric universal breakers can be used, in addition to breaking up and demolition work, for driving in earthing rods as lightning conductors, driving in piles using special hoods, and ramming in probes to obtain soil samples for geological purposes and environmental soil examinations. The telecommunications construction sector, and fencing/tent building companies are also frequent users of this type of equipment. This range of advanced petrol breakers can be used in a wide variety of applications, since the equipment does not rely on compressed air or electricity. Type BH 23 is used mainly for breaking and demolition work in road construction and civil engineering applications. 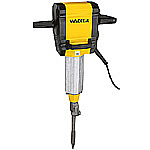 Other applications are driving in of piles, tent pegs, earthing rods and probes to establish ground contamination. Maximum work output is easy with the EHB as this high performance, lightweight electric rotary/demolition hammer is ideal for a wide range of applications. 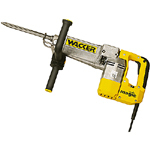 Designed for building remodeling, heating, sanitary, plumbing or scaffolding applications as well as demolition jobs. The optimum weight distribution allows the EHB to be easily operated in an overhead position.